The Freedom Flotilla Coalition (FFC) condemns Israel’s brutal act of state piracy in attacking the aptly named Hurriya (Liberty) vessel which attempted to leave the port of Gaza today filled with people needing urgent medical assistance as well as students and crew, as they attempted to peacefully make safe passage to Cyprus. This latest attempt to break the illegal blockade of Gaza continues the brave challenges during the Great March of Return, where more than 120 Palestinians have been shot and killed by Israeli snipers and thousands severely injured. Communication was lost with the Gaza Flotilla vessel around 3pm local time today, after it was reported to have been surrounded by warships of the Israeli Occupation Forces about nine nautical miles off the coast of Gaza. Organisers hold Israel responsible for the safety and well-being of everyone on board, including those people suffering from pre-existing serious injuries who were seeking medical treatment abroad. Since March 30, 2018, when Palestinians in Gaza began the Great Return March, the UN Office of Coordination of Humanitarian Affairs reports that medical facilities in Gaza, already overstrained by the longstanding shortages of medical supplies, electricity and fuel, are struggling to cope with the overwhelming number of casualties. We remind governments of the world and international organizations that this Israeli attack at just nine nautical miles from the Palestinian coast at Gaza is well within the 20 nautical mile marine zone which Palestinians are supposed to be guaranteed under international agreements, as well as within the 12 nautical miles to which all coastal peoples are legally entitled. Given the declared itinerary of Hurriya (Liberty), from Palestinian territorial waters through international waters to Cyprus, there can be no possible ‘military’ or ‘security’ justification for this Israeli attack. Like our Freedom Flotilla vessels that have been violently seized over the last eight years, their course was never towards Israel nor towards Israeli waters: they posed no threat to anyone. 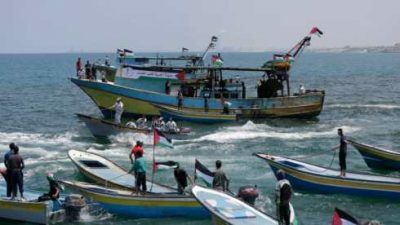 Like Israel’s daily armed attacks on Palestinian fishing boats and the arbitrary restrictions on fishing areas off Gaza, today’s attack is a clear violation of international law and of Israel’s obligations under the Geneva Convention as the occupying power. Just as the Great March of Return is an affirmation of Palestinians freedom of movement back to the communities they were ethnically cleansed from in 1947 and 1948, today’s Gaza Flotilla is a powerful affirmation of freedom of movement that is directed towards the outside world, not towards lands currently occupied by Israel. We condemn all violations of freedom of movement, including the “marine barrier” that Israel has recently been reported to be constructing. Article 13 of the Universal Declaration of Human Rights affirms the rights of every person to move freely around their own country as well as the right to leave and return to their country. We stand with Palestinians, especially those in Gaza, until they achieve full recognition and protection of their rights, including full freedom of movement. We are grateful for the amazing work of everyone who reported live on today’s events, including journalists from one of our Palestinian partners in Gaza, We Are Not Numbers who have been providing video and statements from the port of Gaza and from on the water. We have the deepest respect for your courageous reporting and we are honoured to help bring Palestinian voices like yours to the world.